Below you will find some most common examples (specific applications) of our labelling machines for applying three labels on various products. 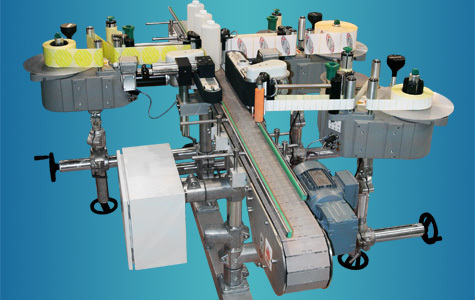 This labelling machine is designed for applying three self-adhesive labels on the sides of an elliptical product. The two labels are applied on the face sides of a product, and the third one – on the back side. Comes with three automatic labellers (the two are from one side, and the third one is opposite), orienting device, counter-conveyor, chain belt conveyor, and a control box. 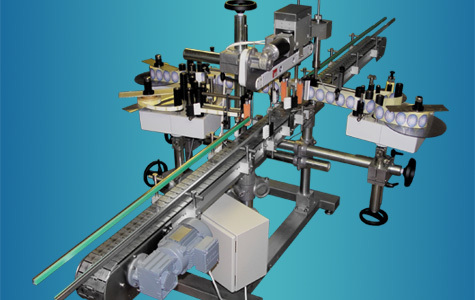 This labelling machine is designed for applying three self-adhesive labels on the sides of a cylindrical product. For example, for labelling a bottle with a label, counter-label and excise label. Comes with three automatic labellers (the two are from one side, and the third one is opposite), main conveyor, two lateral conveyors for rotation, and a control box.